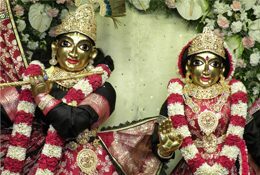 Sri Chaitanya Mahaprabhu (Gaura) and Sri Nityananda Prabhu (Nitai) are none other than Lord Krishna and Balarama. Both of Them appeared in the land of Gauḍa (West Bengal) to dissipate the darkness of ignorance and bestow benediction upon everyone. Sri Chaitanya Mahaprabhu is also known as Gaurāṅga. It is said that the complexion of His body is radiant like molten gold. He appeared in Śrīdhāma Māyāpura, a quarter in the city of Navadvīpa in Bengal, as the son of Śrī Jagannātha Miśra and Śrīmatī Śacīdevī, in the year 1486 AD. He inaugurated the Sankirtana Movement and encouraged congregational chanting of the Hare Krishna Maha-mantra. In this Kali Yuga, there is no other better way than chanting the holy names to achieve perfection in spiritual life. Nityananda Prabhu, an eternal associate of Sri Chaitanya Mahaprabhu, appeared at the same time in Ekachakra dhama, to assist the Lord in His mission of propagating the Yuga Dharma. Vaishnava acharyas emphatically state that people who try to understand Sri Chaitanya Mahaprabhu without getting the mercy of Nityananda Prabhu will never succeed and one must pray very sincerely to Lord Nityananda Prabhu as the adi-guru (original spiritual master) to be delivered to the Lotus feet of Sri Chaitanya Mahaprabhu.